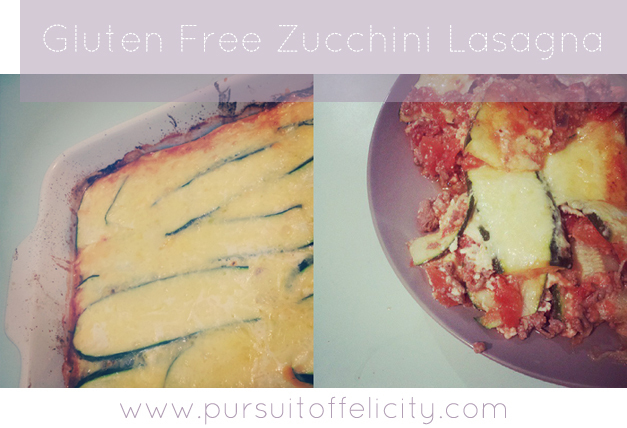 Pursuit of Felicity: Gluten Free Zucchini Lasagna Recipe. 2. Pour olive oil into an electric frying pan and cook the mince until brown. 3. Add garlic, onion, salt and pepper and continue to cook for a few more minutes. 4. Add crushed tomatoes, basil and simmer on a low heat for 10-20 minutes until the sauce becomes thick. 5. Slice zucchini into ½ cm thick slices, lightly salt and leave to sit out for 15 minutes. After 15 minutes, lightly dab the zucchini slices with a paper towel to remove excess water and some of the salt. 6. In a large, lightly greased casserole dish, spread half of the turkey mince sauce on the bottom and then cover with half the zucchini slices. Sprinkle with half a cup of mozzarella cheese. Repeat this process one more time and then place your casserole dish in the oven. 7. Bake uncovered for around 45 minutes before serving.